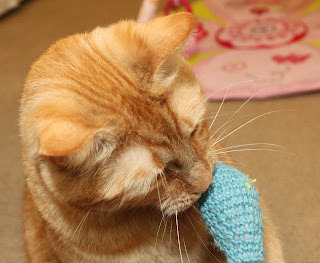 On Tuesday night I was browsing through some free crochet patterns on Ravelry. I was looking at Valentine things and somehow ended up finding the cutest little whale pattern! I decided it was easy enough I'd just try it. It was late but we weren't in bed yet because we were hoping Haly would fall asleep before we did. So, in between a few baby feedings and some crying, I finished a whale. It was perfect until I stuffed it. Then I realized I need a smaller crochet hook or bigger yarn because the stuffing was showing through the stitches. I set the whale on the couch arm to contemplate improvements. Tom said it needed a pom-pom so it could spout water out the top. My mom gave me some pom-pom makers for Christmas so I tried it and set it on top of the whale. Tom laughed and said it was too big, but we both thought it was pretty cute. Last night the whale was still sitting around, unsure what he wanted to do. Tom suggested giving him to the cats to see what they would do. He tossed the whale over. Missy didn't care about him at all. Strange... she's the one I would have guessed would love a new toy. Orangey stared from his cozy spot on Tom's motorcycle gear. Then a few minutes later he pounced. Apparently Mr. Whale rolls around in a pretty entertaining manner. I walked down to the kitchen in the middle of the night and found Mr. Whale and Orangey kitty crashed on the living room floor. This morning I've continued observing them. Mr. Whale accompanies Orangey to the kitty kibbles, down the hall, to check on baby Haly when she cries, and who knows where else!